Took this long trade on the EU late afternoon on a Friday (2.45pm GMT) – probably my first mistake. Significant level was 1.3571 which was set by overall range low on 6 Jan and provided support on the following days. Was unsure whether this was a ‘strong’ level or not – second mistake (uncertainty)? Stop run created plus confirmation candle up, entry point was 1.3580 about 15 pips from the low which is the minimum required for a pullback entry, so not the best entry – lacked patience. 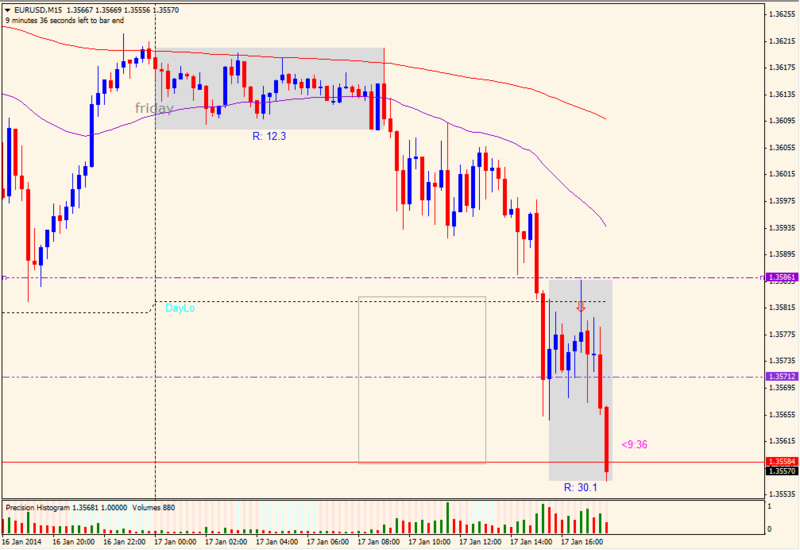 Anyway, trade went against me -20 pips. Its good that you see where the mistakes were made, we don’t generally learn much from our winners, .. too busy feeling pleased with ourselves.. but that’s never a good time to be talking trades really. they can work, but if it just runs out of steam and dribbles sideways, then the weekend arrives. Tues-Thurs are the most reliable days.